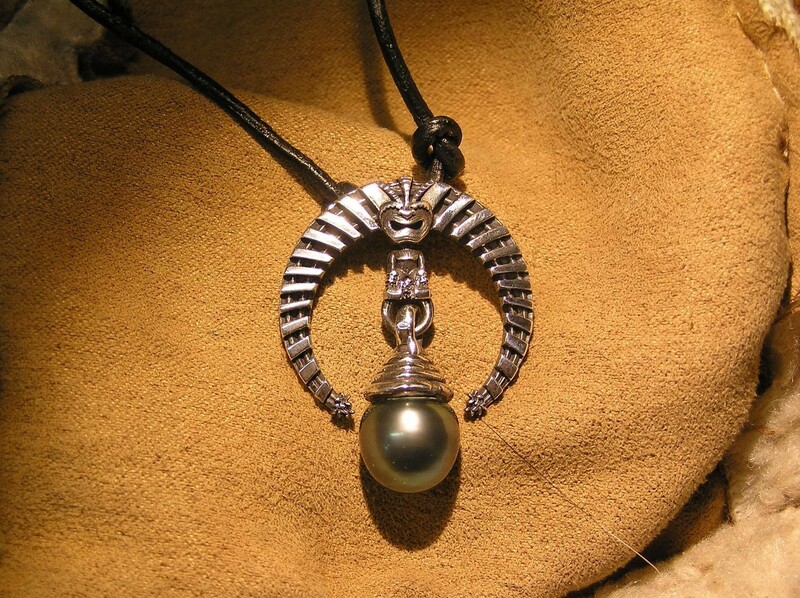 Round tiki pendant with a 10-11 mm genuine Tahitian Pearl dangle. This is referred to as the "small" version of the pendant (even though the overall size of this one and the large one are almost the same) because the tiki body is smaller and the headdress proportion is larger. This pendant is 27 mm wide x 27 mm high and the pearl is 10-11 mm. Sterling silver. Design Notes:This is actually the first version I built of this tiki pendant. This tiki is Kanaloa and is based on a Hawaiian carving of this old Polynesian sea god of death, darkness, water and squid. Fishermen and water lovers look to Kanaloa for protection. In Hawaiian lore he is often partnered with Kane.